If you’re on the lookout for a new front door, security is of paramount importance; you or your family’s security should never be compromised. With this in mind, and in light of National Home Security Month which is shortly upon us, we at Fineline Windows thought we’d give you the low-down on how to find the securest front door for your home. Approved Document Q covers the protection of entry points to any new home, including doors and windows. Under this standard, all new doors and windows must meet the security requirements of PAS24. Asking if your new door meets the standards of Approved Document Q is a sure way to determine whether or not it’s secure enough for your home. The PAS24 standard provides a method for testing and assessing the security performance requirements of all doors and windows, regardless of the material they’re constructed from. It is often detailed as PAS24:2012, however this standard was superseded in 2016. Therefore, PAS24:2016 is now used instead. What security hardware should I look out for on a front door? Now that we’ve looked at types of security accreditation for doors, there is a range of hardware you can look out for to help determine a door’s security credentials. One of the most common ways for burglars to enter your home is by snapping the lock cylinder. This technique, known as lock snapping, accounts for a number of burglaries in England and Wales. Ensuring a TS007 Kitemarked lock cylinder has been fitted will prevent you from becoming another victim of this forced entry technique. These types of cylinders may also be called anti-snap cylinders. Generally, multi-point locking systems are operated by lifting the door handle from either side of the door and turning a key to lock or unlock them. However, if the door is the only means of escape, an internal thumbturn is in place. Multi-point locks secure a front door at a variety of points in the frame, making it exceedingly more difficult for burglars to force entry to your home. If you’re planning on having a glazed section or two on your front door, look out for whether or not the toughened glass is available. Toughened glass can be up to 5 times stronger than normal glass, meaning breaking it is considerably more difficult. 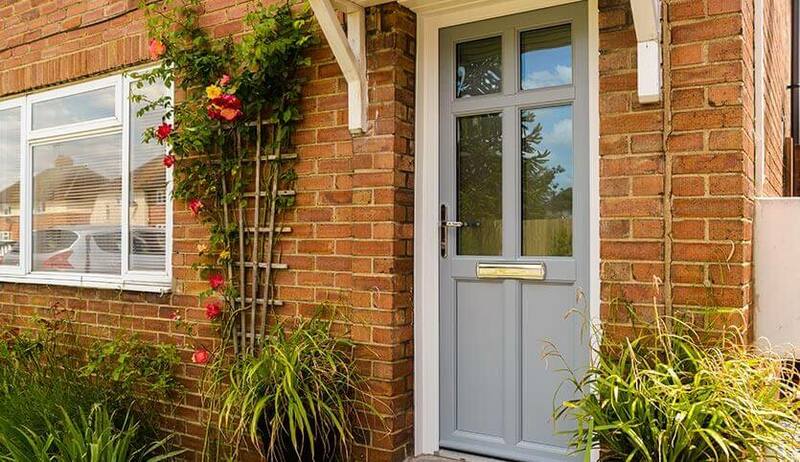 If you’re in the market for a new front door, get in touch with Fineline Windows today. Our entrance doors are PAS24 accredited and fitted with the latest security hardware, ensuring your home will be incredibly secure. We supply them in either hardwood, uPVC, aluminium or composite materials.